Channel the power of the moon and turn the curse of lycanthropy into a potent blessing with Pathfinder Player Companion: Blood of the Moon! Whether you were born with traces of bestial blood from a lycanthropic ancestor or you were bitten by a werewolf and have transformed into one completely, this volume contains everything you need to embrace the beast within and become a fearsome weapon against your enemies. Become a protector of the natural world as a scion of a werebear, revel in bloodshed with the wolf fighting style created by your ancestors, or find your calling in the witch practices of your werecrocodile forerunners. Even if you do not take directly after these bestial horrors of the night, there is much to learn from associating with them - as either ally or hunter. 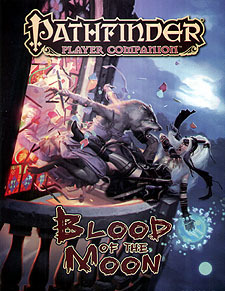 The choice is yours with Pathfinder Companion: Blood of the Moon! Rules and information for the all-new skinwalker race - versatile humans distantly descended from lycanthropes, who have the power to take monstrous forms. New feats, spells, magic items, and rules options for characters from all walks of life - including the new lunar oracle mystery, transformative globes of moonlight, and mighty pelts that grant the powers of animals! The Pathfinder Player Companion is intended for use with the Pathfinder Roleplaying Game and the Pathfinder campaign setting, but can easily be incorporated into any fantasy world.